Our 99-cent Aldi pineapple was the sweetiest, juiciest treat. Stretch the tropical fun a little farther by growing your own pineapple plant. 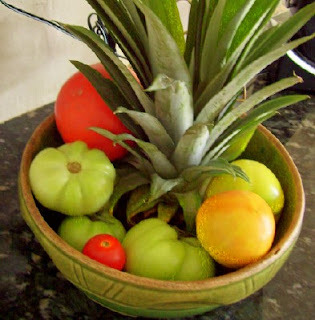 I stuck our spiky top in the fruit bowl for a kitchen decoration, but we'll pot it up properly when it dries a bit. Here are complete directions for planting your pineapple top from You Grow Girl. Those Aldi pineapples ARE the most delicious things I have had in a while! Maybe it is a pregnancy craving, but I just love it. I'll have to try growing one next time. Pink Pixie is always begging me to buy a pineapple and I always say "not this time". I think tomorrow we'll get one and see if we can grow it. Our trick is actually eating the pineapple before it goes bad! I'll have to bring it home and cut it right away so we don't waste it this time! What a fun thing to do. I love pineapple and this would be a fun thing to do with munchkin. My best friend's dad did this and a pineapple grew right up in his front yard. But he lives in hawaii. i didn't kno wyou could do this elsewhere! We twisted the top off ours, trimmed the bottom leaves, stuck it in some water till the rootlets began to grow and then planted it in a planter. Ours is doing just fine that way...it's outside right now-soon I'll want to get a bigger planter for it. I'll have to re-visit Aldi's. I've never seen pineapples there. What a treat!